Where is Larry David when you need him? Tonight while my wife and I were having dinner at a local restaurant, there was a kid screaming for about twenty minutes while five adults (her two parents, her two grandparents and her nanny) sat there stubbornly eating their dinner. To the considerable dismay of the other thirty patrons who did not have screaming children, the five adults made little meaningful attempt to shut her up other than unsuccessfully trying to stuff bread and a bottle in her mouth . Finally, after the father finished his dinner, he graciously picked up the screaming kid and took her outside. As he did so, the restaurant erupted in applause. All along I was praying there was a Larry David in the room who would get up and go tell them what the rest of us were all thinking–that these selfish, inconsiderate people were ruining dinner for everyone else. But strangely, no one was willing to confront them. 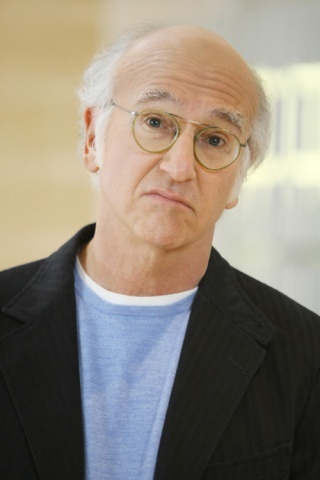 As fans of Curb Your Enthusiasm know, Larry would never have tolerated the situation. He is a “social assassin” who breaks the rules of etiquette, challenges social convention and says what is on his mind. There is a little of him in all of us. We think it, but he says it. And we laugh uncomfortably when he does. But sometimes we just wish we could hire him for a social “hit” or two. This entry was posted in Humor, Ruminations, Television, TV and tagged Children, Comedy, Curb Your Enthusiasm, HBO, Humor, Larry David, Parenting, Parents, Sitcoms, Television, TV. Bookmark the permalink. You could always do what I do and ask the restaurant owners to take of the disturbance. They were among those applauding! Or he could have played the role of social assassin himself as he so frequently does. Great post. I hate screaming minihumans, but dislike the parents who let them more as well. My real question, since this is my first visit to your blog, is this: Dude, how do you read all those books at once? I read multiple books, like watching TV, flipping back and forth between subjects (sports, history, business, biography, entertainment, fiction, mystery) depending on mood, venue or time of day. If Larry had confronted the screaming child’s parents, he would have found out that the kid had just been through a bone marrow transplant for Leukemia.